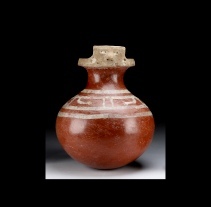 An excellent globular effigy vessel from the Michoacan culture, Mexico. Ca. 100 B.C. - 250 A.D. Stands over 10" in height. 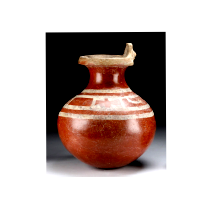 Cream paint over highly burnished red slip. A sweet rectangular face on extended rim with arms painted in front. An additional representation of a bird with outstretched wings in reverse on sides. 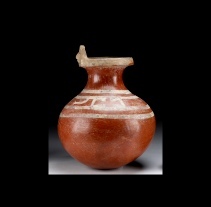 Comparable example is published in The Teuchitlan Tradition and a similar pot is owned by the American Museum of Natural History albeit without the superior quality and size possessed by this Galeria Contici vessel.